New research presented at this year's European Congress on Obesity (ECO) in Vienna, Austria (23-26 May) shows that a daily use of a novel nasal device to reduce smelling ability can induce weight loss and changes to dietary preferences in people aged 50 years and under. The study was conducted by Dr. Dror Dicker, Hasharon Hospital, Rabin Medical Center, Petah Tikva, Israel and colleagues. Food odours and our sense of smell can have a significant influence on how much we eat as well as our dietary preferences. There has been extensive study into the role of olfaction (smell) in regulating appetite, food intake, and body weight, but the mechanisms involved are so complex that we have only begun to understand this system. We know that exposure to food odours increases how much we eat, while loss of smell may lead to reduced food intake. Being overweight or obese can actually sometimes reduce our sense of smell, but overweight and obese people have also been found to have a greater sensitivity to food smells and higher stimulation of their appetite when exposed to food odours which leads them to eating larger portions of food. Olfaction declines as we age, typically beginning around the age of 50. No studies up to now have deliberately reduced the ability to smell and observed its effect on weight loss in human subjects. The authors conducted a pilot study to determine if a soft silicone nasal insert (Beck Medical, Israel) could be used by obese subjects to reduce their ability to smell, with a resulting reduction in body weight, a change in dietary preferences, and an improvement in metabolic dysfunction. 65 obese adults completed the trial, device group (37) and control group (28). The participants in the study group wore the novel nasal insert daily, and those in the control group inserted "placebo" drops of saline into each nostril daily. All participants were put on a diet with a 500 calorie per day deficit from their regular diet, and follow-up visits occurred every two weeks. Measurements of each subject's weight, olfactory sensitivity, as well as glucose, insulin, and lipid levels were made at the start and end of the study period. The study found that the nasal device worked as planned, causing a significant drop in olfactory sensitivity, while the placebo saline drops had no effect. Participants in both groups lost weight but when considering the research group as a whole, there was not significant difference in the amount of weight lost by those who used the device compared to the control group. However, analysis of the results according to whether the subject's age was above or below 50 years, found that among participants ages ?50 years, weight loss in the nasal device group was significantly greater than in the control group (7.7% of body weight in device vs. 4.2% in control). In addition, dietary preferences for sugar, artificial sweeteners, and sweet beverages were significantly reduced in device relatively to control for the whole population and primarily for those age ?50. Furthermore, Insulin levels for the whole population reduced significantly in device group from beginning to end of the trial, while no significant difference occurred in control. The team conclude: "This novel smell-reducing self-administered nasal device caused weight loss in subjects aged ?50 years and reduced dietary preference for sweet food for all participants,". They add: "Further studies should be conducted to explore this new option and to determine the role of this device for treatment of obesity and diabetes". 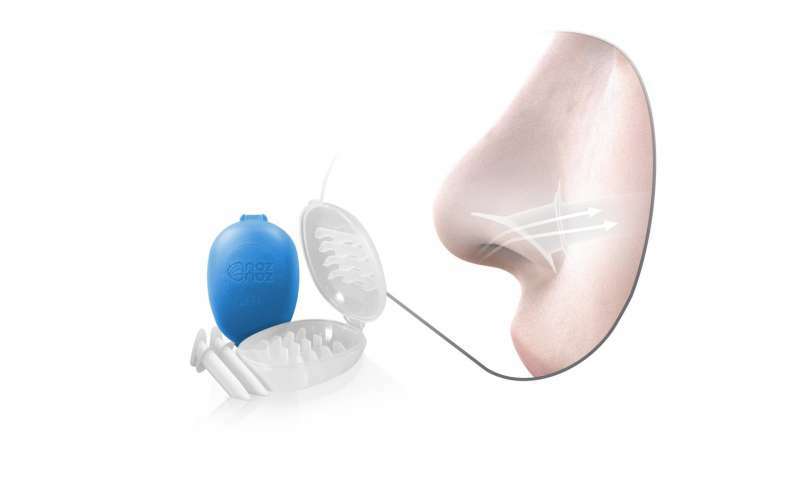 The wearable nasal insert is planned to be commercially available within few months, and will be marketed under the name NozNoz as a non-medical wellness device, while additional medical research is planned to further support its clinical future use.